This rave goes out to the immitigable Rachelle Diaz a.k.a. Mrs. Art Diva. 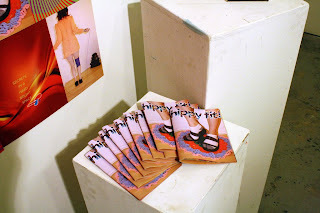 This particular project, a zine called "Hippy Fit" is a quirky, bold and passionate take on being fit and female in the current century. I won't tell you what my favorite part about this zine is because, once again, it is SO AFFORDABLE. Buy it for inspiration, or whatever at only $5 clams. The culture of zine has been around for a long time, but there is nothing as fulfilling as making your own. What are you obsessed about? What are you mad about? What are you happy about? Make a zine about it already dammit. Buy a cheapie zine or two first to get some ideas of how they are put together, and run on from there my zine-making-friends.